We’ve all been there: you come home later after work, drag yourself to the gym or out for a run. Then, you get back (even later now) and open your fridge: womp, womp. 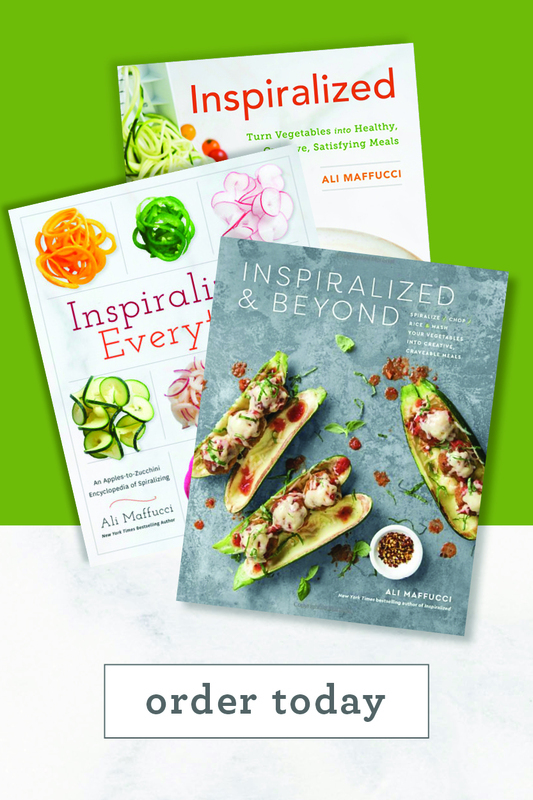 Whether your fridge just has celery sticks and mustard in it or it’s packed with plenty of food, your energy levels are zero and the last thing you want to do is slave over a meal. As much as you want to just sit on the couch with cheese and crackers or make a peanut butter and jelly and call it a night, it’s so important to properly recover after your workout and nourish your body properly. I’ve got just the meal for that. You see, your muscles need the proper nutrients to rebuild, so a) you see the best results and b) you can start preparing yourself for that next workout. Essentially, you’re replacing water and glycogen losses. Glyco-what? I’ve read so much about post-workout eating and the consensus is that you need two things: protein and carbohydrates… well, and one more thing: water. You don’t need to be a sports nutritionist or a high performance athlete to understand these basic principles. What you do need to know is what types of proteins and what types of carbohydrates are the biggest bang for your buck after a workout. 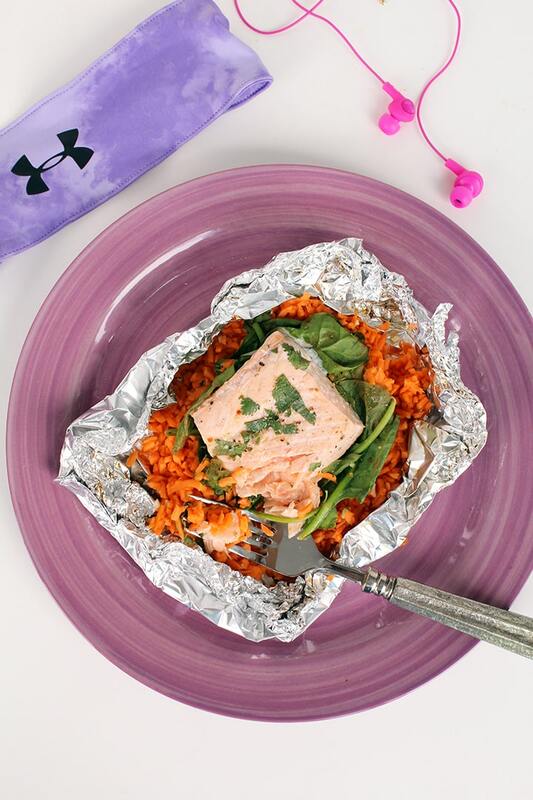 You can’t go wrong with spinach, salmon and sweet potatoes. What a snoozer, right? 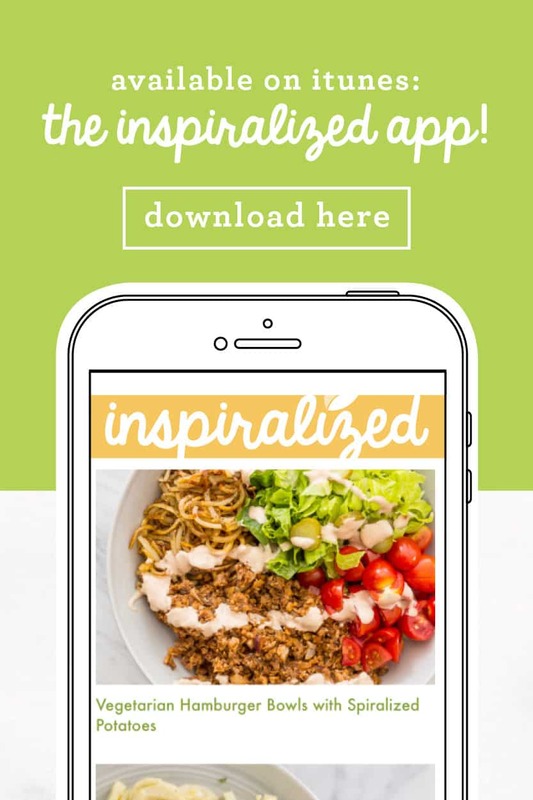 Not if you Inspiralize the sweet potato! Step 1: Preheat your oven. Step 3: Throw some spinach and 1 cup of the sweet potato rice in a bowl with a minced garlic clove, 2 teaspoons of chopped cilantro and some salt and pepper. Add some chopped tomatoes if you’re feeling it, if not, keep it simple. Reserve any extra sweet potato rice for future meals. Step 4: Place the rice mixture in the middle of a sheet of aluminum foil. Set aside. Step 5: Season a 4oz piece of salmon with salt, pepper, and place it on top of the rice mixture. Drizzle over the juice of half a lemon, garnish with extra chopped cilantro and lay a lemon slice on top. 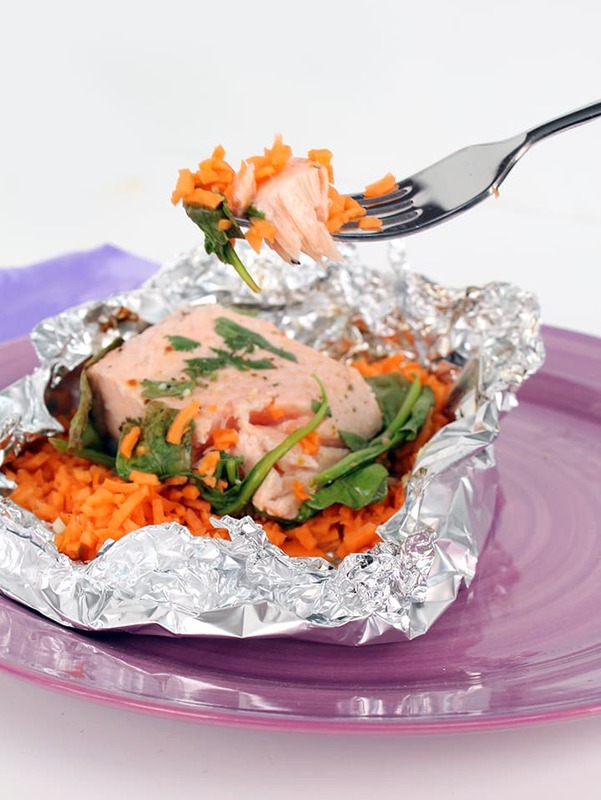 Step 6: The oven is preheated by now, so fold up your foil into a packet, leaving about 1″ at the top. Roast at 400 degrees F for 15-20 minutes, depending on the thickness of your salmon. Step 7: While your fish is cooking, clean up any mess you might have made during the preparation process. It shouldn’t be much. 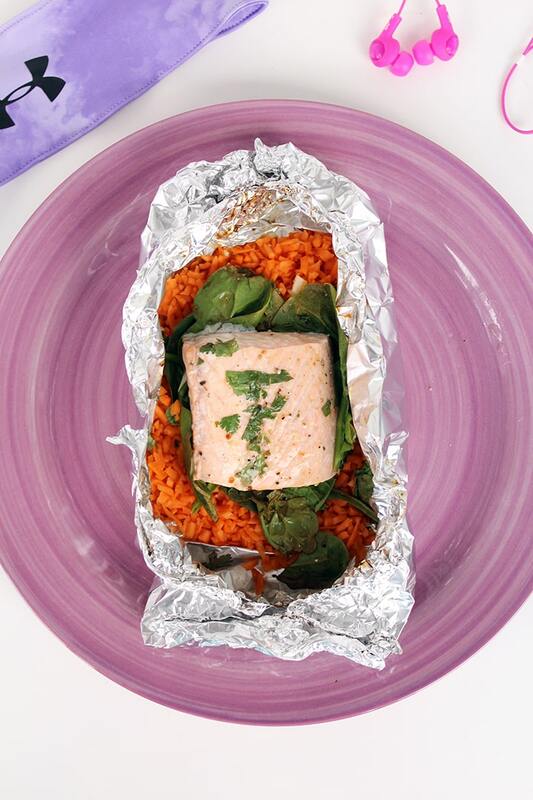 Step 8: Take your finished salmon packet out of the oven and serve on a plate, in the foil. Step 9: When done eating, throw away the foil and clean the plate. Step 10: Enjoy the rest of your night! I find that whenever I fuel my body properly after a workout (within an hour or so), my next workout is even better. Plus, I see the results sooner, which motivates me to keep going. Who doesn’t love results, right? 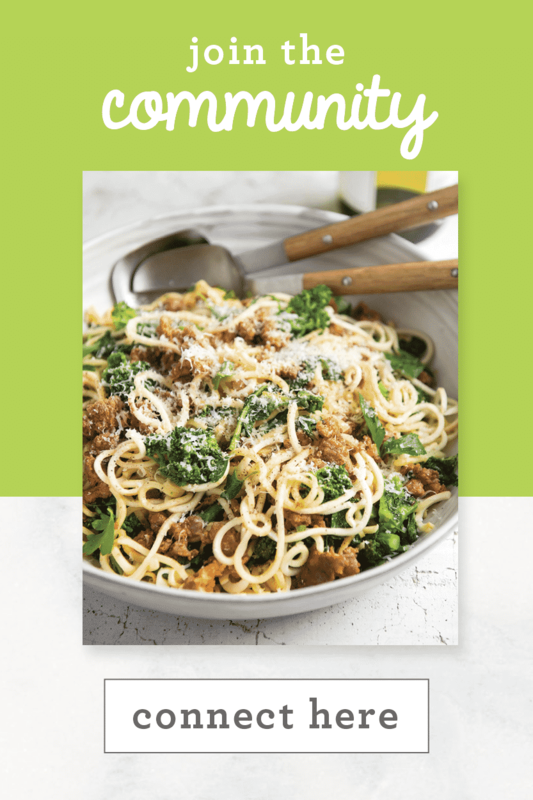 This dinner is full of fresh flavor and is easy to make, satisfying, filling and packed with healthy Omega-3 fatty acids, iron, magnesium, dietary fiber, zinc, Vitamin B6, D, C and of course, an appropriate amount of carbs and protein. If you really want to save time, make the sweet potato rice ahead of time! 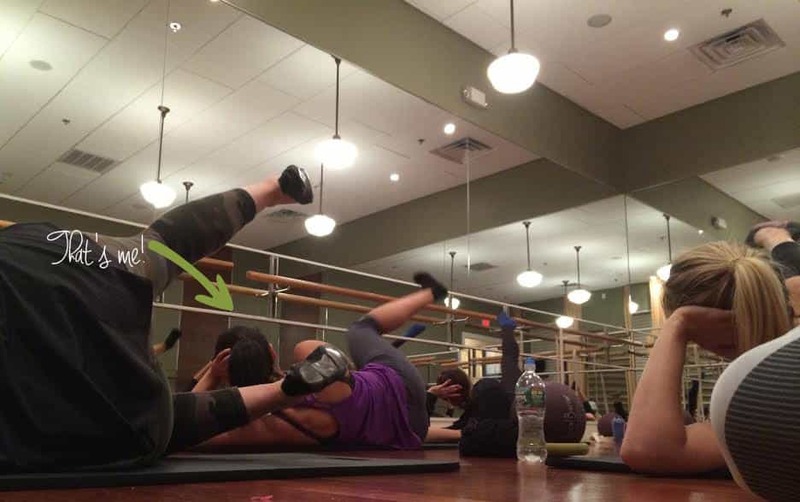 Since we’re talking about working out and fueling our bodies, I wanted to share with you one of my favorite workout classes to do in my area: barre. 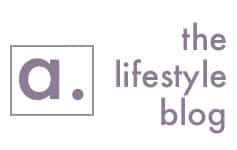 After all, I love supporting local businesses, especially when they’re all about keeping you fit and healthy. 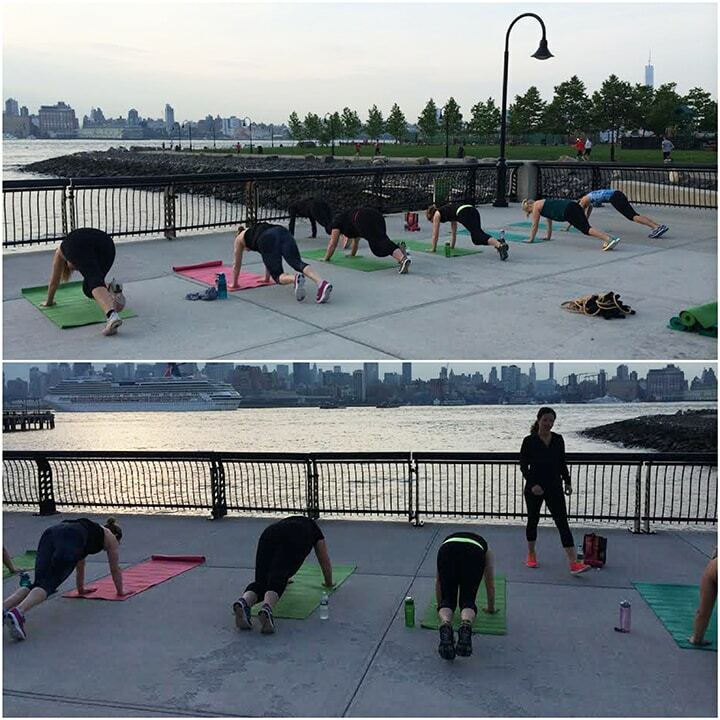 The team at Local Barre in Hoboken, NJ does just that: challenge you mentally and physically! When I first went to a Local Barre class, I was weary. As someone who needs to excessively sweat to feel like she got a good workout in, I wasn’t sure if I’d like barre. To my happy surprise, this class was intense and I left thinking, “Oh man, I’m going to be sore!” If you’re unfamiliar with barre exercise, it’s basically based off of exercises done at a ballet barre combined with elements of ballet, Pilates, and yoga. Barre relies on your own bodyweight for resistance. Because of this, the moves challenge your core stability and balance. You’ll be lightly pulsing your toes in the air together and somehow your whole body is shaking and you don’t think you’ll be able to finish the 10 seconds left. It challenges your body in ways that running and other types of strength and resistance training won’t, which I love. What I love about Local Barre specifically is their friendly staff and their motivating instructors. Unlike in a spin class where your teachers are essentially yelling at you (which I do love) these instructors are encouraging you to push yourself while remaining positive, upbeat and helping you along the way (whether it’s adjusting your shoulders or demonstrating something one-on-one. I’m not flexible nor do I have any dance experience, but I was surprised that I could make it through a class without feeling like the odd ball. And let me tell you, you’re gonna burn. 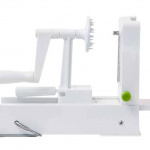 While the oven is preheating, peel and spiralize the sweet potato, using Blade C. Place the noodles into a food processor and pulse until rice-like. Set aside 1 cup of rice into a mixing bowl and save the rest for future meals. Mince the garlic clove, chop 2 teaspoons of cilantro (leaving a little extra to garnish) and add it to the mixing bowl and season with salt and pepper. Toss to combine. In the middle of a piece of tinfoil about 10 x 10, add in the rice mixture. Top the rice mixture with the spinach and then top with the salmon and drizzle with the olive oil and rub in with fingertips or brush. Season generously with salt and pepper. Garnish with extra cilantro. Slice the lemon in half and squeeze one half over the top of the mixture. Then, place one thinly sliced lemon piece (from the other half) on top of the salmon. 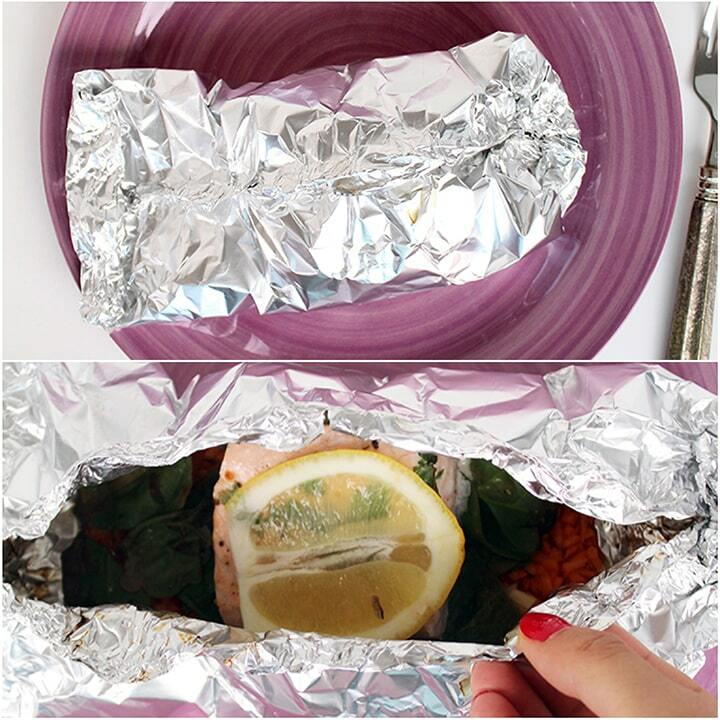 Fold the foil into a pouch over the mixture, securing at the top, leaving about 1" of room for the salmon to steam. Bake for 20-25 minutes, depending on the thickness of the salmon. 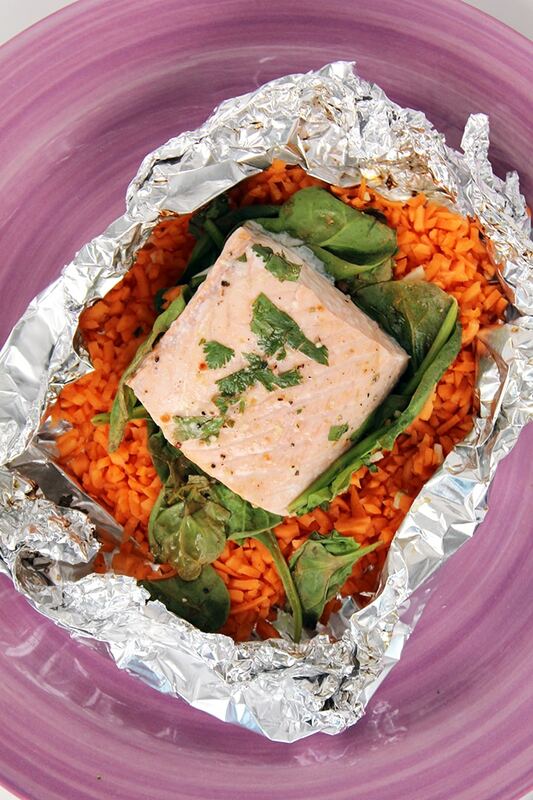 Remove from oven and serve on a plate, eating directly out of the foil. This looks great! I'm not a fan of fish, could I use something else in place? 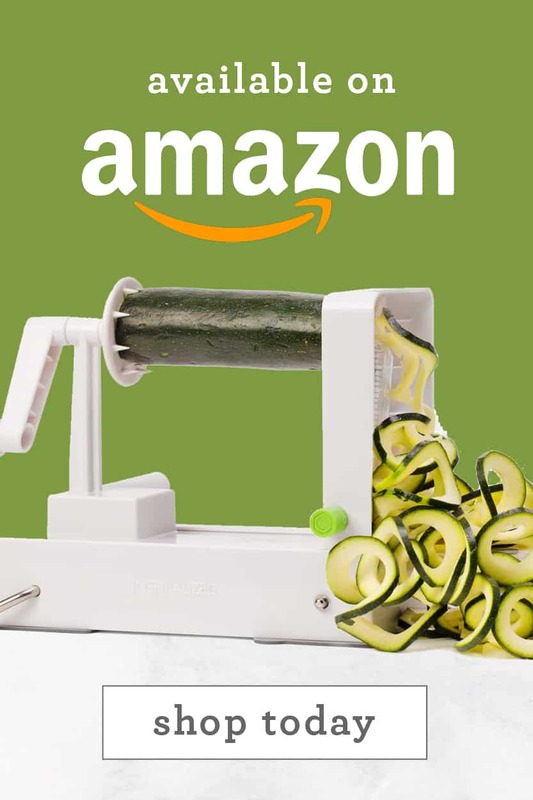 I am awaiting my spiralizer from Amazon now. I'd love to try any of the barre classes! I've heard so much about it but haven't had a chance to try!! 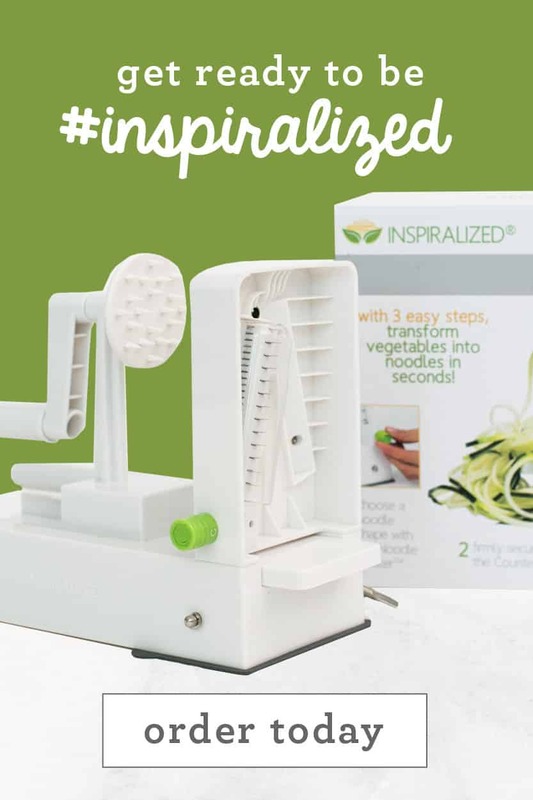 This is a great giveaway, I walk by everyday and have always wanted to try! I love barre classes and funny enough have never gone there even though I live in Hoboken! Love this! SO simple! Thanks! I would try the a Open Barre class, I have a friend who goes and loves it! SPORTS BARRE sounds like a lot of fun! I love the variety! 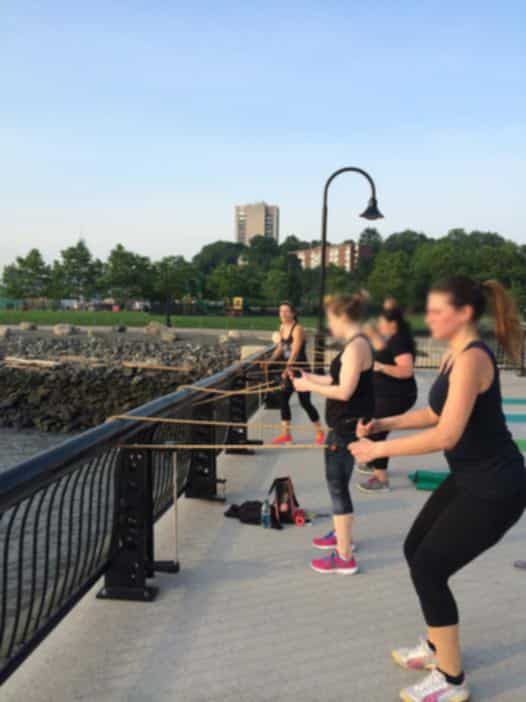 I've taken classes at Local Barre before, but I've never tried Sports Barre! Made a variation of this with kale and eggs instead of salmon and kale! Thanks for the inspiration Ali! Just pre-prepared my sweet potato rice in advance for dinner after Body Step work-out tomorrow and it turned out amazingly well! I am so excited to have this meal tomorrow - I have really been missing salmon recently as it's not much featured in the meal plan I'm following atm, so thank-you Ali for providing a healthy and delicious way to enjoy one of my fave foods without blowing the calories!! I'm so happy to hear that! Keep up the good work with your healthy journey! I'm going to run out of words to describe these incredible meals you keep dreaming up!! 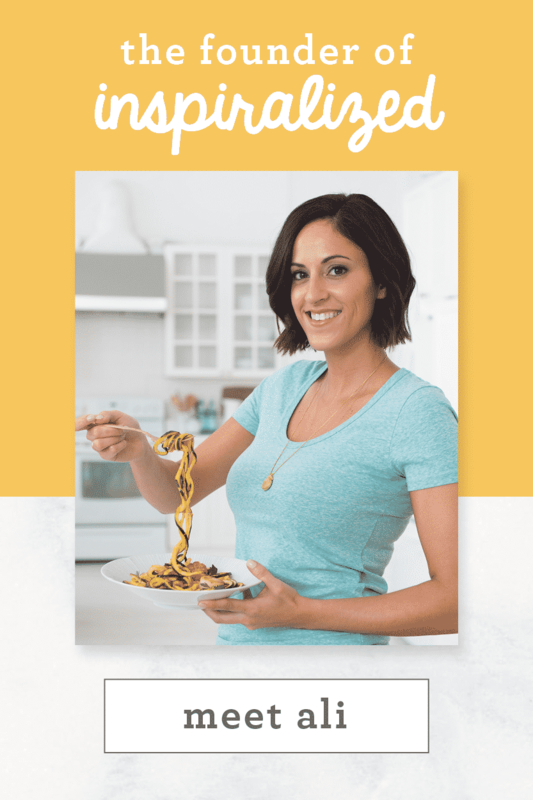 I just finished eating this one and it is super easy, super delicious, super healthy and one I will have probably once a week! I really like salmon and have it two or three times a week ..always wild caught. I did substitute baby kale for the spinach since that's what I had in fridge.....can I say again thank you, thank you for all your hard work and expertise....God has given you a wonderful gift and I appreciate your sharing it with all of us out here in web land. Have a fun weekend Ali. My sweet potatoes were still to crunchy for my taste, and in trying to replicate rice. Could be cause it doesn't cook long enough? Any suggestions to make it softer, and more like a rice type texture instead of crunchy? However I did still like the flavor combos! Perhaps cook the rice in a skillet for 5 minutes prior to baking, to start the cooking process! Hope that helps !